A Syrian journalist today tells U.S. Secretary of State John Kerry to first sit with his chum Bashar al-Assad to test the water before asking the Syrian opposition to come to the table to negotiate a transition. His remarks shocked much of the regional press. Editorially, eminent Syrian author and journalist Ghassan al-Mufleh writes in an op-ed for Elaph that Kerry – not the opposition -- should be the one to open the discourse with Assad. The U.S. secretary of state’s personal connection with the Assad family goes back more than two decades. It strengthened after the Syrian army’s exit from Lebanon in 2005. 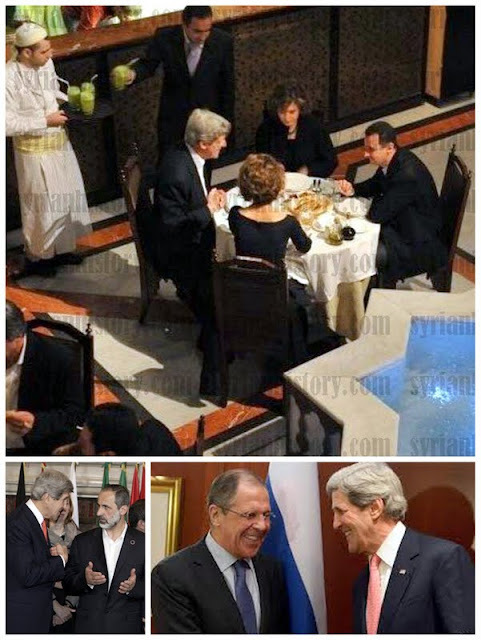 Sen. Kerry was the main driving force in talks (1) to extricate the Assad clique from the clutches of the Special Tribunal for Lebanon (STL) mandated to identify and try those responsible for the assassination of Rafik Hariri, and (2) to then rehabilitate the clique. I wrote about this at the time. And when John Kerry was first nominated to the position of secretary of state, I wrote that the central reason for handing him the job is his familiarity with the Syria File and his personal relationship with the Assad clique. I also warned against the clique’s international exoneration as it still enjoyed a measure of international cover. I also cited the Sudanese example, and how Omar al-Bashir is walking free after the International Criminal Court issued a warrant for his arrest on charges of crimes against humanity. The price for his reprieve was the creation of the Republic of South Sudan and the South Sudan’s Chinese oil puzzle. John Kerry did not take long to avow his wish to tackle the Syria File as the principal representative of the Israel-condoned Assad clique. Incidentally, Kerry is also in favor of rehabilitating the Iranian regime and preserving its Mullahs at the helm. The Iranian opposition can thus expect to come under U.S. pressure as well. The aforesaid is in keeping with the strategy of President Barack Obama’s inner circle. (Remember how the White House vetoed last year’s plan -- backed by Panetta-Dempsey-Clinton-Petraeus -- to arm carefully vetted Syrian rebels). Bypassing the Obama-Kerry plan taking shape is the responsibility of the Syrian opposition and revolutionary forces. But not to sound totally negative, the U.S. secretary of state can head to Damascus for a dialogue with the Assad clique before implicating the Syrian opposition in the game of the clique’s rehabilitation. Let Kerry kickoff a firsthand dialogue. Should he fail, he would bear sole responsibility for the step without the Syrian Revolution bearing its consequences.